I love the River Severn, but I tend to stay way upstream, as it wends its way through Shropshire. Canoeing down under Ironbridge and over the Jackfield Rapids has to be one of my favourite things. The Severn as we see it in this episode of Britain at Low Tide is a different beast altogether. Treacherous, changeable, fast and swirling. Hard to navigate, and hard to cross. But intriguingly, the challenge of crossing this natural barrier appears to have brought communities on each bank of the river closer together, rather than driving them apart. Even today, you can hear people on the Wye side of the river talk about ‘Forest Folk’ and ‘River Folk’; kinship with the water runs deep. I cannot overstate how dangerous this stretch of the Severn is. The tides rush in. People can, and do, get caught out and die. To get permission to film, we had to have a hovercraft on standby to rescue us, just in case. We also had to fortune to be guided by Frank Larkham, local skipper (and one of the few remaining people with the knowledge to pilot up river beyond Aust) and owner of the Wastdale and Arkendale wrecks. His knowledge of the tides kept us safe getting to and from these boats. Even so, it was tense. Please, please don’t be foolhardy and venture out into the mud yourself unless you know what you are doing, and take all the necessary precautions (if you don’t know what these are: DON’T GO). AND CHECK THE TIDES. I love tunnels, especially lost or abandoned ones, so I was gutted I didn’t get to do this story. Lucky Oliver! A bit of extra info, with links, in case you want to delve a bit deeper into the stories featured in Episode Two of Britain at Low Tide, Series Two. This particular episode was fun, but also very moving to film. It’s a funny feeling, because from the safe distance of 2018, it is all to easy to get caught up in the excitiment of a Girls Own adventure — I got to ride in a tank! And go out on a boat! And explore beneath the waves with a remotely operated submersible! And then it hits you: the reality of war. People died. And their loved ones didn’t know why, or when, or where. FOR OVER FIFTY YEARS. Thankfully, people like John Pearson exist. He’s not just a tank enthusiast, though I am glad he is that too (thanks for the tank ride, John! ): he was he was responsible for placing the plaque at Fort Henry commemorating the six men who died in Exercise Smash. For the first time, family members like Joan Brunt, the widow of Arthur Parks, had a memorial for their loved ones where they could mourn their passing. Just six names amongst the tens of millions of people who died worldwide in the second world war. But worth remembering nonetheless. Next week we are across the border on the River Clyde, where we lark around in the mud investigating how a river as ridiculously shallow as the Clyde ended up becoming the shipyard for some of the world’s largest ships… and get scorched uncovering the secrets of a mysterious crannog — 8pm, 3rd March, Channel 4. View from the turret. I felt a bit like Margaret Thatcher. Oliver is sent below, where he belongs. Valentine Duplex Drive tanks weren’t actually used in D-Day. Instead, by the time the 6th June 1944 came around, enough of the bigger and better (it didn’t have to have it’s gun turret spun around in the wrong direction while afloat..) Sherman Tanks had been modified to duplex drive, with the characteristic canvas skirts. Valentines continued to be used for training, and also saw active service in Italy 1945. Britain at Low Tide is BACK! Britain at Low Tide is back for a new series! Six whole episodes, airing over six weeks, of archaeological and historical goodness (and the odd bit of geology I managed to squeeze in under the radar), starting 8pm, Saturday 17th February, on Channel 4. And it’s all bathed in glorious sunshine (well, mostly…) to banish the damp, drear days of never-ending winter. This series, Gustav, Charlotte, Oliver and I are visiting the shorelines of East Sussex (Episode 1, 17th Feb), Dorset (Episode 2, 24th Feb), The Clyde (Episode 3, 3rd March), The Severn (Episode 4, 10th March), East Yorkshire (Episode 5, 17th March), and Fife (Episode 6, 24th March). We have shipwrecks, lost harbours, sunken tanks, enigmatic structures, incredible feats of Bronze Age engineering, crannogs, beacons, Bob Dylan, medieval graffiti, Pictish cave art, ancient forests, ferries, trains, and seaplanes (and their lighters). Do watch! Because we can only ever scrape the surface of any subject in a 47 minute TV programme, here are some pointers for further reading [plus links to free downloads, where I have been able to find them]. The absolute bee-knee’s, all you could ever wish for, guide to Shropshire geology — Peter Toghill’s brilliant book, The Geology of Shropshire. Callow, R.H.T and Brasier, M.D. (2009). A solution to Darwin’s dilemma of 1859: exceptional preservation in Salter’s material from the late Ediacaran Longmyndian Supergroup, England. Journal of the Geological Society 2009, v. 166, 1-4. DOI: 10.1144/0016-76492008-095. [FREE full text here]. Those thin sections — infinitesimally thin slices, viewed under a microscope to reveal the rock’s internal structure– were from rocks collected at Stoer Bay in Northwest Scotland. This bay, beside a scattering of crofters cottages and a ruined Thomas Telford church, is famous amongst geologists because, until recently, and despite 100 years of study, the sediments at Stoer just didn’t make sense. In particular, one section of the rocks — known as the Stac Fada Member — was a puzzle. Wedged between layers of Torridonian Sandstone, and flecked with tiny fragments of greenish glass, it told of some event that was hot enough to melt rock (that glass!) and powerful enough to force itself between layers of sand, folding them in dramatic fashion as it did so. A volcanic mudflow, or lahar, seemed like the best explanation. However, there was no evidence of other volcanic activity in the region around that time period. To test this, Ken needed microscopic evidence. The presence of shocked quartz would indicate that the Stac Fada member was material — or ‘ejecta’ — flung far and wide by an asteroid impact, and not volcanic in origin. He didn’t really expect to find any: after all this region is one of the most studied in the world, and a mecca for geologists. 1.2 billion years ago an asteroid hit the UK, somewhere in the vicinity of Stoer Bay. I first met Mike Simms when I was over in Belfast to look at the Ulster Museum’s collection of Sicilian dwarf elephants. That is another story. This story, the story of Scotland’s lost asteroid crater, began over tea and biscuits when Mike told me about his upcoming holiday to Assynt. Mike Simms is the Curator of Palaeontology at the Ulster Museum. He is a proper, old skool, Natural Historian, with expertise that runs from lichens to speleology to fossils. Much of his personal collection of fossils, collected since childhood, can now be found in the collections of the Natural History Museum in London. And like any proper Natural Historian, he has a thing for rocks. When Mike read Ken Amor’s 2008 paper identifying the Stac Fada Member as impact ejecta, the only such deposit in the UK, those particular rocks jumped up his list of must-see places. So in June 2011, on a holiday with fellow geology enthusiast Geoff Steel, Mike insisted that they went to see the Stac Fada member for themselves. These blocks, formed of chunks of three billion year old Lewissian Gneiss, sat in the finely-grained sandstone that underlay the Stac Fada Member. Big heavy blocks that could not have been transported there by the gentle forces that laid down the sand around them. Mike’s explanation? They were the first wave of destruction let loose by the asteroid impact, chunks of bedrock torn and tossed asunder. They would have rained down from the sky, before — seconds later — being covered by the roiling mixture of melted and unmelted rock, buoyed on a superheated cushion of steam, that is now the Stac Fada Member. Twenty five miles up the coast, at Stoer Bay, the force of the impact ejecta — and the effect of the cushion of steam that carried it forth — can be seen in the dramatic folding of the sandstone layers around the Stac Fada Member. Steam became trapped in the mudstone layers, before exploding out and tearing layers of sand apart, while the impact eject was forced between those layers like great wedges. When Mike saw those wedges he realised he could work out the direction that the impact ejecta had come from. But he had to wait until a return visit in September of the same year to properly puzzle it out (that ferry to Lewis couldn’t wait!). The wedges thinned out towards the west, and so must have been travelling from a point of impact somewhere to the east. Inland. This meant the impact crater could still be there. You may be surprised to learn that gravity actually varies very slightly across the surface of the earth, in relation to the density of the rock in each area. This is because gravitational pull is related to the mass of an object (just imagine holding two similar sized lumps of rock in your hand: one made of chalk, the other granite. The granite is heavier because it is denser, and has more mass). So an area with lots of chalk, like the White Cliffs of Dover, has lower gravity than an area like the Isle of Lewis whose bedrock is the dense Lewisian Gneiss. If an asteroid left a crater in the middle of some dense Lewisian Gneiss 1.2 billion years ago, as the boulders at Second Coast suggested, that crater would have rapidly been infilled with less dense Torridonian sandstone, leaving a tell-tale zone of lower gravity. But 1.2 billion years is an awful lot of time, and thanks to plate tectonics, the Earth’s surface does not lie dormant. Between 410 and 430 million years ago the continents collided, closing the ancient Iapetus Ocean and uniting the rocks of what is now Scotland and England for the first time. In the process Scotland was compressed, with the rocks to the east thrust up and over those to the west, building mountains in the process. The effects of this can still be seen today, particularly in the Assynt region, where one billion year old Moine schists (a metamorphic rock) sit on top of half a billion year old limestones. These same Moine schists would have been pulled, like a shroud, over any impact crater, potentially destroying it in the process. What Mike saw on that British Geological Survey May was an area known as the Lairg Gravity Low, named for the small sheep market town at its centre. And now Mike had an explanation for it: it was his impact crater. He just had to convince everyone else. The zircon is shown here in in red. The yellow lamellae that cut across the zircon are reidite. The phases have been identified using a technique called “electron backscatter diffraction”. Image from Steven Reddy (Curtin University). Ken Amor’s identification of the Stac Fada member as impact ejecta hadn’t been universally welcomed. Subsequent research by Gordon Osinski, Lousia Preston and colleagues indicated that the amount of shocked quartz present in the Stac Fada sediments was much, much less than that found in other terrestrial impact ejecta, and concluded that it could be better explained as volcanic material that had been transported by water. And so it was that three years on from Ken’s publication, as Mike was making his own discoveries, the asteroid impact origins of the Stac Fada Member were still a highly debated topic. On top of this Mike wasn’t an impact crater specialist. Together, this set the bar high for having his research accepted by the scientific community. It was just after Mike had received those helpful comments from his reviewers that he and I sat down for tea and biscuits in the Ulster Museums offsite store. Rather than get cross, or whinge about the review process, or even try to find a way to weasel out of addressing the reviewers comments, Mike was gearing up for another trip to Assynt to collect more data. And as I asked him about his upcoming ‘holiday’, I could feel how excited he was. It was palpable. And when he filled my in on the backstory, I could see why. There was a lot to play for. But on top of his own data, Mike also had to contend with criticisms levelled at the impact ejecta theory itself, and there was nothing he could do about that: his field observations related to the direction the Stac Fada member was travelling when it was deposited, not its ultimate origins. So he could collect all the extra data in the world, but without definitive proof of an asteroid impact in the region, he was sunk. Fortunately for Mike, another group of scientists were addressing this problem at exactly the same time. Steven Reddy and Tim Johnson from Curtin University, Australia, had taken a closer look at shocked zircon grains within the Stac Fada member. Viewing the grains with a scanning electron microscope, and analysing the structure of those grains in fine detail, they identified the presence of an extremely rare mineral known as reidite within the zircon grains themselves. Reidite (ZrSiO4) is only formed at incredibly high pressures, and these pressures are only experienced at the Earth’s crust in the event of an asteroid impact. The discovery of reidite in the Stac Fada Member was unequivocal proof that it was impact ejecta. Ken Amor was right. An asteroid had hit NW Scotland 1.2 billion years ago. It was now up to Mike to make his case for exactly where that impact had occurred. Over the course of four years, Mike visited every single exposure of Stac Fada. At each site he meticulously observed and recorded the features that provided directional evidence. From those wedges of ejecta at Stoer, to the orientation of malteser-like pimples known as ‘accretionary lapilli’* at Enard Bay, it all pointed in the same direction: towards Lairg. His final trip, in 2015, clinched it, and his paper was accepted for publication. 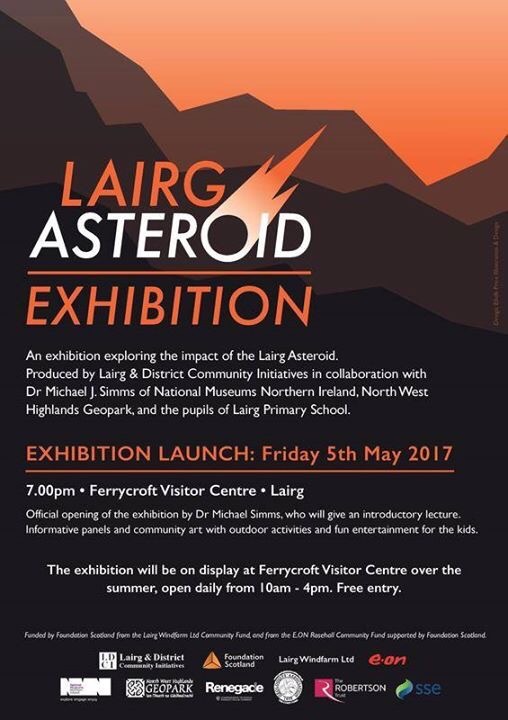 By identifying the Lairg Gravity Low as an impact crater, and measuring it (over 40km wide), Mike was able to estimate the size of the asteroid that hit Britain 1.2 billion years ago. At 3km in diameter, this puts it in the top 20 worldwide of known asteroid impacts. So is that case closed for Scotland’s Lost Asteroid? Well, not quite. Anyone up for digging a borehole? *accretionary lapilli are basically hail stones made of, well, stone. They are formed, layer upon concentric layer, in turbulent, superheated dust clouds until they fall to the ground under their own weight. Their presence is yet another illustration of just how apocalyptic the conditions must have been when the Stac Fada member was deposited. Mike Simms, for being so bloody interesting and clever and for letting me tag along with him for a week in Assynt to make Walking Through Time and benefit from his ingenious work. And for answering even more questions for this blogpost. Ken Amor, for telling me all about his own eureka moment in 2006, and then answering even more questions. And for being such a good sport about not being featured in the programme itself. Tim Johnson, for letting me use his SEM images of the Stac Fada quartz grains replete with reidite, both in this blogpost and also on the programme. Louisa Preston, for bringing her research on the Stac Fada to my attention, and for generally being awesome. The Walking Through Time team and Rosalind support team, for making the Assynt adventure so special: Nick Clarke Powell, Cressida Kinnear, Pete Allibone, AJ Butterworth, Paul Rigby, Clare Keeley, Adrian Glover, Lilly Herridge and Adam Hayward. Rosalind Glover, for being the most patient and adventurous of babies, enjoying nappies changes and breastfeeding in some of the most remote and beautiful places in the British Isles.